The image depicts the difference between a normal and ADHD brain. 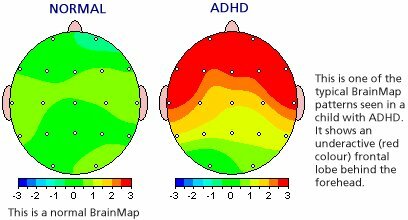 You can see that ADHD brains typically have very high activity in the frontal lobe making it difficult to think, calm down and focus. 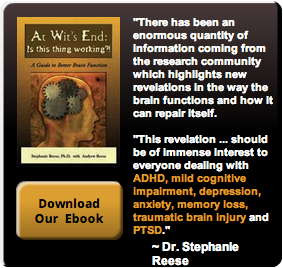 Until recently, it was believed that children outgrew ADHD in adolescence. However, it is now known that ADHD symptoms can continue into adulthood. In fact, ADHD does not develop spontaneously in adults. If you have ADHD as an adult then you had ADHD symptoms as a child even if they went undiagnosed. It is just much more difficult to identify them as adults because they usually turn to self-medication to ease the symptoms. During childhood, the condition is more common in boys than girls, but this ratio appears to even out by adulthood. Adults with ADHD may be chronically late to work or important events. They may be disorganized, restless, and have difficulty relaxing. Some people with ADHD have trouble concentrating while reading. Mood swings, low self-esteem, and poor anger management are also common problems. Many times adults self-medicate to decrease these symptoms with caffeine, alcohol, drugs and cigarettes. Although individuals with ADHD can be very successful in life, if the disorder goes undiagnosed or untreated, they may struggle at work and in relationships, and have chronic emotional difficulties such as anxiety and depression. The good news is there is a solution. BrainAdvantage can change the way the brain functions and reacts to situations giving the ADHD person the ability to think through problems and cope with life’s challenges much more effectively without medication. Call us today at 949-276-8704 to see how we can help! Intriguing post. I Have Been pondering about this issue, so a debt of gratitude is in order for posting. Entirely cool post.It 's extremely exceptionally decent and Useful post.Thanks KP-LOK DBB valve.